Dear Amy, your band and fans, your songs penetrate my soul and I drown in your sorrowful, haunting words. You are my idol and uif you have been through any of the things you sing about, I admire you even more, because I have and I am only 18. If you could do one thing for me and the rest of the world,never ever stop being who you are. OMG!! Dis song absolutly ROX, Amy is sooo beautiflu in da film clip and everything bouut it rox, i have the single of dis song and Fallen coz the are sooo cool. If u dont like this song u r mad, Amy rox!!! The storyline behind the song is sad though, but Amy is a strong woman so she had the strenght to caryy on Go Evanescence, yeeeeeeeew! woot woot! does any1 know where you can buy the dresses for that video because I really love them and want to buy them! ya!!!! !u rock!I love ur new song! 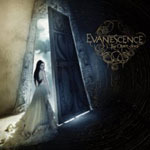 i like evanescence alot i'm going to buy the cd tomorrow i have the money. OMFG! I CANT WAIT UNTIL THE ALBUM COMES OUT!!!!! !